Liu Bang (ca. 256-195 B.C.) - After the death of Qin Shĭ Huángdi, the Qin Dynasty did not survive long. A military leader named Xiang Yu of the state of Chu overthrew the Qin in 206 B.C. and briefly held power; but never claimed the title of emperor. That position went to a man named Liu Bang who almost immediately went to war with Xiang Yu and defeated him in the Chu-Han War (206-202 B.C.). Liu Bang would become Emperor Gaozu and founded the Han Dynasty, the greatest of China's ancient empires, and one that would coincide roughly with the Roman Empire in the West. Unlike most of China's emperors, Liu Bang came from a peasant background and, as a result, nothing is really known of his parents. However, myth records that his mother had a dream of meeting a divine being who told her that she would give birth to a ruler, and, at that moment, the sky darkened and turned stormy. When Liu's father came to attend her, he saw a dragon. Soon after, she was found to be pregnant, and later gave birth to the child Liu. As emperor, he diverged from the harsh rule of Qin Shĭ Huángdi, returning to a Confucian philosophy of leadership. 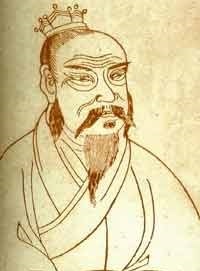 Initially, he didn't think very highly of Confucianism, but was later persuaded by a scholar named Lu Gu. However, like Qin Shĭ Huángdi, he believed in strong central rule and dealt swiftly with potential rivals. He was considered an able military leader, but was killed by a stray arrow while trying to put down the Ying Bu rebellion, an extension of the earlier Chu-Han War.